They compelled a passer-by, who was coming in from the country, to carry his cross; it was Simon of Cyrene, the father of Alexander and Rufus. 22Then they brought Jesus* to the place called Golgotha (which means the place of a skull). 23And they offered him wine mixed with myrrh; but he did not take it. 24And they crucified him, and divided his clothes among them, casting lots to decide what each should take. We know the town from where he came–Cyrene, an ancient Greek colony that became a Roman colony near modern-day Shahhat, Libya. We know that he was a father of two sons. Beyond that, this man Simon is essentially an anonymous bystander. We don’t know why he was there at all. Had he intended to come and bring his sons to this gory event or had they planned to visit Jerusalem, perhaps steep themselves in history and a little shopping, without realizing what this day would bring? We don’t know what about him prompted the guards to literally pluck him out of the crowd. All we know is that this man lives in history as the one, the only one, who helped Jesus carry his cross to Golgotha. The Scriptures do not say that he responded in any way other than to do it. It is interesting that in all those years upon years of God’s calls being met with “no, not me, please not me” that this anonymous man about whom we know little would be the one to do this. So God calls a scared, young, no-name peasant girl to bring Jesus into the world and a foreign, probably dark-skinned, anonymous bystander to carry him out. Isn’t that just like God? Here, just before the end, God slips one more Divine reversal in. You know, Simon had to be afraid. Good grief. Here he was in the middle of the processional to a crucifixion! What if they killed him too? What would happen to his sons? His family was miles away. How would they even know what had happened to him? And, yet, he didn’t seem to question his role. 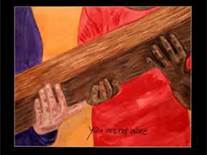 He put his hand on Jesus’ shoulder as if to say, “I’m here.” Then he leaned down and picked up the heavy cross, being careful to place his hands rather than running them down the splintering wood. And then they began to walk–Jesus and this man, this dark-skinned anonymous man who Jesus had never met, this child of God, this new disciple, this one who without hesitation carried the cross of his Savior. He would go through the gates and up the hill, touching the edge between life and death. But, again, I have to ask, where were those disciples? Where were those who Jesus had called, who Jesus had groomed, who had been part of Jesus’ ministry, who had been Jesus’ friends? Why was it THIS man and not them? Why was it Simon that when it was all said and done was the first to take the yoke of Christ unto himself? After all, it seems, the disciples would have been in the best position. It would have made a whole lot more sense. But, then, where would we be? Where would those of us who Jesus had called, who Jesus had groomed, who are part of Jesus’ ministry? Why isn’t it us touching the edge between life and death? Why do we hold back? 28 ‘Come to me, all you that are weary and are carrying heavy burdens, and I will give you rest. 29Take my yoke upon you, and learn from me; for I am gentle and humble in heart, and you will find rest for your souls. 30For my yoke is easy, and my burden is light.’ (Matthew 11: 28-30). See, we read this with such comfort at what Jesus can do for us. But what does it mean to “take my yoke”? For, THAT is the way that our souls will rest. So, on this Lenten journey, move from being an anonymous bystander to a disciple of Christ.